Just a quick note to say how grateful I am for the copy of Irrational Knowledge that you mailed last week. Admire it very much for its warmth, strange beauty, and shifting architectures of music. Rereading this afternoon, I am taken again by its meditation on presence. Seems to me that the book initiates an exploration of the way poverty abandons intention to activity as “sheaves of loss” allow for layers of contact: “is there anything you couldn’t get at” (1, 3). These poems are stunning in their ability to entrust themselves to their occasions: “in each/ instance a story has been culled/ take net and left fallow [follow]” (4). They are generously open (intuitive) and none too careful as they erode into the “reverie of distant ownings” (23). They know the “pull of old magic sound” that comes through the “fruit” of “limited tact” (5). 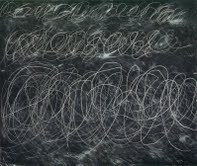 Meaning is a constellation in momentum: “at the exact point/ where the horses run off/ foam-licked to the bit/ a knot of horse tails/ holding the heard together/ rear to rear” (9). Meaning is one thing and the “dislocation of its holy” because revelation always finds circumstances underway: Irrational Knowledge (15). When “Occupations mostly of a domestic nature” are “steeped in the sloughing vat,” domesticity is called into wildness that allows it to continue to grow (8). “Oh opener of field,” etc. (16). The dislocation of agency is the harbinger of change, “the crack where I break you” (18). It’s also a juncture that allows renewed access to “anything” that is to be inherited by the “you” (3). “The path water takes/ always cut from memory” (12): the current always carves another channel; memory is news like the weather. A happening is an edge sharp enough to split a hair: “an avocado tree of one yellow leaf/ distracts me from the story/ outside of this geography” (21). This moment and everything after (“outside”): “two warblers” (21). Nathan Hauke was born and raised in rural Michigan. His first book, In the Marble of Your Animal Eyes, is forthcoming from Publication Studio. He is also the author of chapbooks: S E W N (Horse Less Press 2011) and In the Living Room (Lame House Press 2010). His poetry has been published in American Letters & Commentary, BlazeVox, Colorado Review, Denver Quarterly, Eleven Eleven, Greatcoat, Horse Less Review, Interim, New American Writing, Parthenon West, Peaches and Bats, Real Poetik, Twenty Six, and We Are So Happy To Know Something among others. Two of his poems, “Deerfield (1)” and “A Surface. A Shore or Semi-transparency of Glass,” were recently selected to be a part of The Arcadia Project Anthology that GC Waldrep and Joshua Corey are editing (Ahsahta Press 2012). He co-edits ArkPress with Kirsten Jorgenson and blogs at Blue Rags Stitched Together By Crows.